Periodontal disease is a gum disease that can lead to gum, tooth, and jawbone decay. In pets, this disease begins the same as it does for humans–with plaque. Bacteria in your pet’s mouth feed on plaque, causing oral health issues like tartar, gingivitis, and tooth loss. Periodontal disease is a painful experience and may result in the need for oral surgery. According to the American Veterinary Dental Society, more than 80% of dogs and 70% of cats develop gum disease by the time they are three years old. By the time you see symptoms, your pet may already have periodontal disease. That’s why it’s important to take proactive steps to care for your pet’s teeth early on. Here are some steps you can take to prevent periodontal disease. to start can be less invasive and can help get your pet adjusted to regular teeth cleaning. Make sure to target their gumline–harmful bacteria often live below the surface and cause damage to the teeth. You can also use a child-sized toothbrush or a finger toothbrush. The key to brushing is to do it regularly and thoroughly. If you’re using toothpaste, be sure to pick one up at your local independent pet store that is made specifically for pets. There are many ingredients in human toothpaste, even the children’s varieties, that can be harmful for your pet. Have your vet examine your pet’s teeth and gums for any signs of periodontal disease. If your pet does have a build up of tartar or the beginning stages of periodontal disease, your vet can give them a teeth cleaning and help you take steps to treat periodontitis. What you feed your pet impacts their tooth and gum health. Raw foods, like our Complete Formulas, offer the best solution for maintaining good oral health and preventing gum disease and tooth decay. They are whole food-based and moisture-rich. The enzymes in raw food also help your pet to break down their food. Because raw foods do not contain grains or legumes and are very low in starches, plaque is less likely to form on your pet’s teeth, making it difficult for bacteria to grow. A Raw Bone is a natural toothbrush for your dog or cat. Repetitively chewing as they break down a bone helps to scrape existing plaque from your pet’s teeth and massages their gums. Unlike more traditional commercial dental chews, raw bones do not contain starches that can form additional plaque. Protein-rich raw bones also contain moisture, enzymes, and healthy fats that help keep teeth and gums healthy. 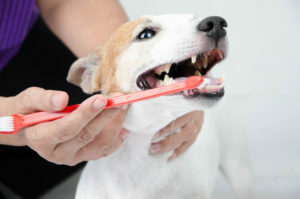 February is Pet Dental Health Month! Let us know what you are doing to keep your pet and their teeth healthy on social media by tagging @primalpetfoods. This entry was posted on Friday, February 8th, 2019 at 2:47 pm	and is filed under Dog, News & Updates. You can follow any responses to this entry through the RSS 2.0 feed. Both comments and pings are currently closed.